The 2014 World Taekwondo Hanmadang Taking Its Place! 세계 태권도인의 무예잔치인 2014 세계 태권도 한마당이 21일 오후 4시 포항실내체육관에서 화려한 막으로 올리고 나흘간의 열전에 들어간다. 태권도 한마당 대회는 태권도가 겨루기 위주의 올림픽 스포츠로 발전하면서 격파와 품새 등 무예로서의 의미를 되찾고 태권도인들의 화합을 다지기 위해 태권도 본산인 국기원이 지난 1992년 창설한 것이다. 대회 초기 1천명내외의 선수단만 참가한 데다 서울에서만 펼쳐지다 해를 거듭할 수록 국내외 선수단 참가규모가 늘어나 올해는 역대 최다국가인 53개국에서 3천400여명의 선수가 참가한다. 당초 이번 대회에는 55개국이 참가신청을 했으나 에볼라 바이러스 발생국과 인접국을 참가대상에서 제외시켰다. 2014 세계 태권도한마당 조직위(위원장 김일문)는 이번 대회에 참가하는 선수단에게 최상의 편의제공을 통한 최고의 대회로 이끌기 위해 그동안 다각적인 노력을 기울여 왔다. 먼저 지난 13일 포항시와 경찰, 소방, 가스안전공사, 전기안전공사, 보건소 등 지역 유관기관들이 모두 모여 대회 기간 중 안전사고 예방을 위한 대책회의를 가졌다. 이 자리에서 행사장 주변 교통 및 안전관리·소방·가스·전기·보건 등 5개 분야에 대한 현안사항 토의와 현장 점검 등으로 안전한 대회개최에 주력하기로 했다. 특히 세계적인 비상이 걸린 에볼라 바이러스 차단 및 방역, 전염자 대책 등에 대해서도 심도있게 논의됐다. 이와 함께 대회운영에 있어 가장 중요한 역할을 차지할 심판진 교육과 선수단 협조를 위한 대표자 회의를 잇따라 개최하고, 적극적인 동참의지를 다졌다. 우선 지난 19일 행사장 인근 티파니 웨딩에서 열린 심판보수교육에서는 이번 대회 경기규칙을 설명하고, 심판진들의 자세에 대한 소양교육을 병행했다. 또 20일에는 국내선수단 대표자 회의를 열어 대회요강 및 주요 안내사항을 알려주는 한편 성공적인 대회개최를 위해 국내선수단의 적극적인 동참을 당부하는 등 노력을 기울여 왔다. 이외에 지난 18일에는 포항시태권도협회에서 이번 대회에 참가하는 53개국 890여명의 외국인 및 외국거주 한국인들에 대한 편의제공 방안에 대해 협의하고, 대회 기간 중 적극적인 참여의지를 다졌다. 경기장 시설 측면에서도 주경기장인 포항실내체육관이 노후돼 최근 계속된 가을장마로 천장일부에 누수가 발생함에 따라 20일부터 보수작업에 들어가 개막식전까지 완벽한 시설을 갖추기로 했다. 이와 함께 포항시의회 자치행정위원회 김성조 위원장을 비롯한 포항시의원 8명이 조직위를 방문해 대회추진현황을 보고받고 성공적인 대회개최에 적극 협조하겠다는 뜻을 전했다. 조직위는 또 이날 오후 8시 포항실내체육관에서 개막식 리허설을 개최하는 등 최종점검을 마쳤다. 한편 이번 대회는 둘째날인 22일 오후 1시30분부터 3시까지 1시간반동안 KBS를 통해 전국에 생중계하기로 해 태권도 저변확대는 물론 포항시 홍보에도 크게 기여할 전망이다. 조직위 관계자는 "태권도가 올림픽 종목으로 선정되면서 세계화에는 성공했지만 태권도가 갖고 있는 무예적 진가는 상대적으로 소홀해 졌다"며 "태권도 한마당 대회는 이같은 문제를 해소하고, 무예로서의 태권도 정신과 진가를 재조명하는데 그 목적이 있다"고 밝혔다. The 2014 World Taekwondo hanmadang will start on the 21st of August and continue for four days. A spectacular opening ceremony will mark the beginning of the festival at 4pm, Pohang Gymnasium. The Taekwondo Hanmadang was founded by Kukkiwon in 1992. The World Taekwondo Headquarters Kukkiwon established it to keep various qualities of Taekwon as a martial art and to provide an opportunity for solidifying the harmony and friendship of the Taekwondo family all around the world. This year the Taekwondo Hanmadang has 3,400 players from 53 nations which is the higheste number of participating nations in its history. Compared to the early years of the festival which had around 1,000 players and took place only in Seoul, there has been a steady increase in the number of participants. At first 55 nations registered for the festival. However, the organizing committee limited the registrations of two nations Nigeria and Ghana due to the concern about the Ebola virus. The 2014 World Taekwondo Hanmadang Organizing Committee(Chairman Kim IlMoon) has made every effort to provide the best and most convenient environment for participants of the festival. On August 13th, Pohang City and its related agencies : the Police, Fire personnel, the Gas Safety Corporation, Electrical Safety Corportation, and Health center met jointly to establish measures for dealing with any emergency situations that may occur during the festival. The meeting not only coveyed many topics from various fields such as traffic control during the festival period, safety supervision, gas, electricity, health care issues but also to insure the safe progress of the festival with continuous field checks. Representatives' meetings for training judges and obtaining participants' cooperation are in progress, solidifying the active support of the organizing body. The judges' training held on the 19th in the Tiffany Wedding Hall was composed of both the rules of the competition and courtesy-training. On the 20th, a national team representatives' meeting was held, asking for players' active participation as well as providing brief overviews of the competition and guidelines. 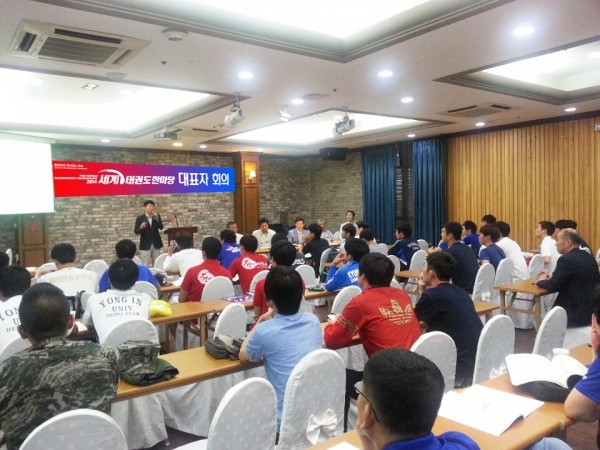 Moreover, on the 18th, the Pohang Taekwondo Association discussed ways of offering amenities to the 890 international participants from 53 nations and solidified its active participation and support which will be needed throughout the competition. On the aspect of facilities, the Pohang gymnasium will be under construction from the 20th to ensure that they will be in perfect condition after a water leak from the rainy season. In addition, 8 members of the Pohang city council, including the province's governmental administrator SungJo Kim, visited the committee and were informed of the current state of affairs. During their visit, they conveyed their message of cooperation. At 8pm that evening, the committee also completed its final check on the rehearsal of the opening ceremony in the Pohang Gymnasium. Meanwhile, KBS will broadcast the competition live throughout the country on the second day (the 22nd) from 1:30 in the afternoon for an hour and a half. They hope to promote Taekwondo as well as Pohang city. One committee authority commented, "Taekwondo has lost its value as a true martial art after its selection as an Olympics sport." He added, "Taekwondo Hanmandang aims to solve such problems and to shed new light on the spirit and value of Taekwondo as a martial art." Supervised by: Richard M. Hamm, Professor of Handong University Language Institute and Min Hwang, Esq. Founder & Executive Director of Women's Hope Center Korea.